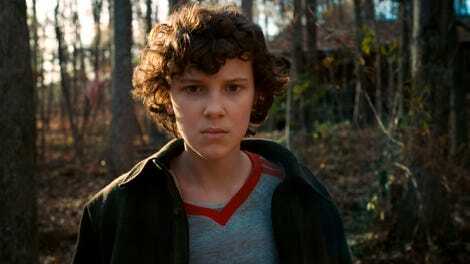 As the action gets moving in the second season, Stranger Things’ Curiosity Voyage (to use Mr. Clarke’s phrase, adopted enthusiastically by Dustin) makes a few navigation errors in its story mechanics and takes on some flotsam in its characterization. But the central story is still right on course. Let’s talk about Mews. The sudden prominence of the Henderson family cat augurs ill for that little guy, right? There is just too much Mews—gobbling up Meow Mix in the foreground, winding around Dustin’s ankles as he brings in the critter he saves from the garbage, his name being called in vain a few times—in the first few episodes for things not to go horribly wrong for that cat. The cliché feels both appropriate to Stranger Things’ genre roots and a little too telegraphed to build real dread. That’s not to say that the show’s unprecedented expansion into central characters’ home lives is unwelcome. The Halloween-costume sequence from “Trick Or Treat, Freak” showcases both boys’ moms (and Lucas’ cheeky little sister) and even reveals that Dustin’s new favorite phrase to describe his new favorite attributes (“These pearls!”) comes straight from his fawning mother. Both Lucas and Dustin got shortchanged on background, if not on personality, last season, and this broader look at their lives away from Mike and Will suggests bigger storylines for both ahead. If nothing else, it’s sensible storytelling to build up Dustin’s life at home before plopping the pollywog, as he first identifies his garbage-can critter, into his hands and his house. Gaten Matarazzo remains a powerhouse of charm, giving Dustin’s vivacious brand of flim-flam real appeal. You can see why adults fall for it as often as they do. (Not Marissa the librarian, who remains #lifegoals.) But even his ability to huckster the clueless adults of Hawkins doesn’t mean he can huckster the viewers. All four boys should be a little, or a lot, more cautious about this “living booger” Dustin calls d’Artagnan (Dart for short). Will, who coughed up something very like d’Artagnan in the season-one finale, can be forgiven for repressing or rejecting the memory as long as he can stand to. But once he spits it out (so to speak), the other boys should be wary enough of fighting another slime-monster for the Upside Down to take a step back from their enthusiasm without this much argument. That’s especially true of Dustin, who sees so much so clearly throughout season one. Well before Max suggests, “Maybe some scientist brought it here and it escaped?” the other four should be thinking of Hawkins Lab. These are smart kids who shared an indelible horror; it would be the first thing they consider in the face of the inexplicable. More character flotsam: Why is Lucas, who’s played D&D alongside his friends for years, relegated to the role of unknowing audience surrogate when the show needs to explain Truesight? Some viewers might need to learn that Truesight grants vision of hidden objects and passages and the ability to view the Ethereal Plane, but Lucas shouldn’t have to, especially when they could explain it to Max, an actual newcomer. Maybe Max’s characterization will become more nuanced, but three episodes in, she’s a Not Like The Other Girls caricature: skilled at the boys’ favorite pastimes, effortlessly cool, with a careless cascade of glorious hair that shows how little she cares about being pretty (unlike El; Justin Doble, credited with writing “The Pollywog,” also wrote the episode featuring El’s clunky makeover scene). That characterization, and the skateboarding scene positioning Max as El’s rival for Mike’s affections, feel less like the simplistic viewpoints of inexperienced kids and more like the simplistic viewpoints of the adults crafting the show. These clumsy moments aren’t self-aware metacommentary; this doesn’t read like a case of their emotional compasses getting spun by a distortion. If the show is a Curiosity Voyage, these are navigation errors in the writing itself. But Stranger Things’ poetic ability to convey deeper meaning through story—for me, the core of its appeal—stays as true as ever. Hopper’s so preoccupied with keeping El safe from “the bad men”—and keeping his town safe from the repercussions that would follow her discovery—that he doesn’t consider how confining his idea of safety is. The montage of Hopper teaching El his simple ground rules intercut with footage of her deliberately breaking them is a little on the nose, but so is a lot of blossoming-teenager behavior. In “The Pollywog,” this concern with—and debate over—what is real intensifies. When Max shows off her skills to Mike, telling him she could join their party as “your zoomer,” he scoffs “That’s not a real thing,” tacitly reinforcing the fiction that their roles of paladin, cleric, bard, and ranger are real. Hopper promises El that she’ll see Mike “soon, and not just in that head of yours… in real life.” But El’s astral glimpses of Mike are as real as her role as mage, and the pause as she almost manages to catch his gaze is heavy with hope—hope that comes crashing down as he turns off his walkie-talkie and stalks away. After the experiences of the past year, all of our main characters have reason to be asking themselves, “What is real?” But there’s a bigger question, and a bigger source of problems, than that. Clarifying some of Will’s history for Max, Lucas alone distinguishes between what’s real and what’s “public knowledge.” It’s hard to explain to an outsider, and Caleb McLaughlin shows Lucas’ conflict between explaining to his new friend and protecting his old friend with clear but economic expressions. In a story of powerful agencies demanding silence about world-altering terrors, that’s a crucial distinction to make. At this point, the central conflict of season two is the conflict between what the characters know and feel and what little they can say about it, even to each other… between the fictions they’re allowed to speak aloud and the buried truth that’s all too real. The presidential campaign signs littering the first half of the season might be more than background color. The 1984 election will fall on November 6, the anniversary of Will’s disappearance. Do you want to bet the “anniversary effect” Dr. Owens describes occurs on the actual anniversary? In any parental relationship, the kid eventually feels some vicarious embarrassment, but Hopper’s hip-popping dance to “You Don’t Mess Around With Jim” drops El right into the deep end of Goofy Dad feelings. Nancy has some of the same steely core Bob sees in Joyce. Nancy punches back. But even if she’s willing to put herself and Jonathan in danger with her Radio Shack purchase and her faux-sneaky phone call, has she considered what danger she’s putting the Hollands in? Will screaming, “Go away!” at the vast tendrils reaching toward him—reaching into him—is heartbreaking. Billy and Max are not siblings.